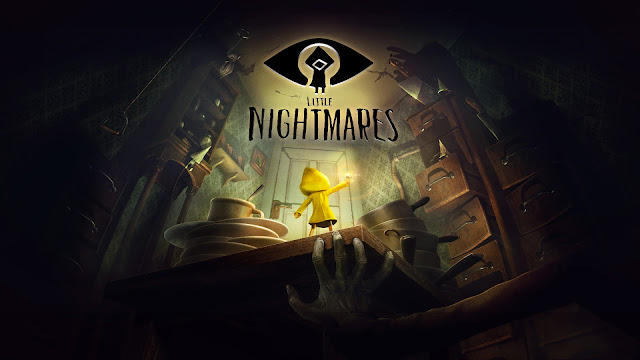 Having a bit of spare cash sitting in the bank last week, I decided to treat myself to one of the many smaller releases found on the Xbox One store, with Little Nightmares (£15.99) being the lucky chosen one. I was review free right up until Friday evening too, but then three games to review came along, and this looked to have been pushed to the side due to it being something I paid for, and not sent to me by a publisher. This morning I found out I was already close to the end of the game though, so decided to run through it quickly and type some words on it before starting on the games I need to this week. Truth be told, Little Nightmares was a game I had only seen images of and tweets here and there last week, with the little thing in a yellow mac being an image that tends to stick out in current day characters doing the rounds. I didn't know what to expect from the game going in, and with many of you seemingly not picking it up, I thought I should be the one to blow my money and be the guinea pig for you all. You play a character by the name of Six, who finds herself waking up in a place known as The Maw, who after being shown a cutscene of a masked lady slowly turning towards you at the start of the game, you wake up to explore and puzzle your way through a game that will last anywhere between four to five hours. As you try your best to escape these new areas you come too, you also come across characters who are intent on grabbing hold of you like some sort of teddy bear. These enemies range from leeches falling from the ceiling at the very start of the game, to later on down the line meeting things that appear to be humans wearing fat suits, that grab you if you get anywhere near or give chase if you are spotted by them. Bar a few moments where I did find myself being startled, the game isn't really scary in terms of the characters you meet at all. The game does, however, have a few tense moments that are helped massively by both audio and music used throughout the game, making it something in the game that stood out now I've beaten it and looking back. I've seen a lot of reviews for Little Nightmares using Limbo or Outside as a game that is something similar to it. For me, however, Little Nightmares reminded me of Unravel, a game I really enjoyed when it came to the Xbox One back in 2016, and also currently available in the vault of EA Access. In both games, you have the cute looking main character, with both games also sharing the gorgeous background scenery on some of the levels. Both games also had the same sort of puzzle element to them too, with swinging and pulling things to reach areas being something you will be doing a lot as you make your way through the game. Little Nightmare sadly has its faults too, with a few things standing out to me with my short time with the game. Of course, the size of the game is going to be an issue for some, with the game costing £15.99, and giving back a decent but short experience in return. The game also has zero replay value to it if you handle the few collectable items on your first playthrough, with only candles/lanterns to light and some trolls to find being the only reason to jump back into one of the five chapters once beating the game if missed previously. Easily the biggest annoyance with the game throughout my time with it was the camera. With moments of utter rage kicking in when you needed to grab hold of an angled chain/ledge when jumping, or walking across pipes or planks, only to fall and have to do it all over again. If this wasn't an issue in the game, I would have made it through the whole game with zero deaths, so to only fail because of the game, it did become more of an annoyance the more times it took place. Overall: Fun, but short. With a camera that may annoy even the calmest of gamers out there. While not being gorgeous all of the time, there are moments when the game truly looks stunning, with music that makes it a both a delight to look at and listen to. If you enjoyed Unravel, then Little Nightmares is certainly something you should think about playing at some point in time. I'm just unsure if it's worth dropping just under £16.00 on it to do so right away. Thanks for being the guinea pig for us all! The length was the only thing stopping me from buying it. As you said it looks like Unravel, a great game with amazing atmosphere​ but a little short. I liked Unravel, Inside and Limbo but I think I bought all of them on sale, played them once and uninstalled. Not much replay value but an experience worth having. Sounds good but i think i will wait for a sale.